Male Gryne pluriarcuata, copyright A. B. Kury. 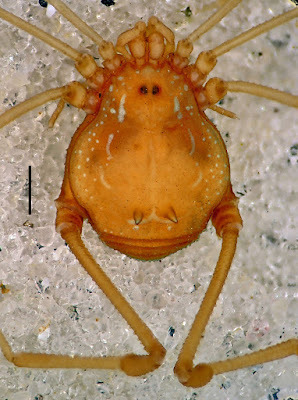 Gryne is a genus of cosmetid harvestmen found in South America with a large pair of central spines on the dorsum. Characters (from Roewer 1923): Slim animals with long, thin legs. Area I with one median tubercle pair; area III with one median spine pair; areas II, IV and IV free tergites I–III unarmed. Second cheliceral segment in both sexes small and normally built. Legs in both sexes with basal segments of legs III and IV of the same habitus and strength as in legs I and II; tarsi I–IV each with more than six segments, variable. Secondary sexual dimorphism expressed in leg IV of male.